(CNN) — Machu Picchu. It’s on most everybody’s bucket list, and for good reasons. It is one of the most transcendentally beautiful spots on earth. But how do you get to the Peruvian Andes, and what do you do to make the trip easy, comfortable and meaningful? Cuzco, the gateway to Machu Picchu, is more than 11,000 feet above sea level, a height that can cause altitude sickness, eespecially for travelers coming from low elevations. 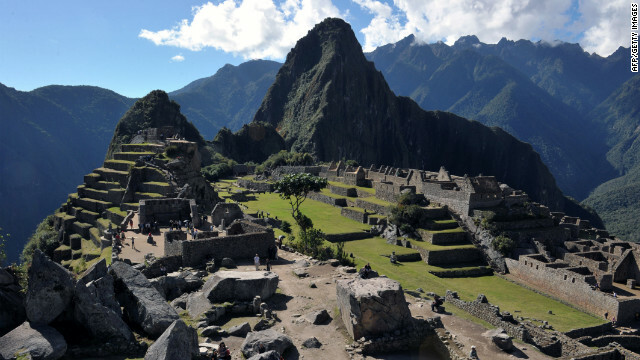 Machu Picchu is at 7,874 feet, so the best plan to mitigate altitude sickness is to arrive at Cuzco in the morning (the first flight from Lima departs at 6 a.m.) and then immediately grab the first train down to Machu Picchu. Enjoy Cuzco on the back end after acclimatization. Several airlines have direct service from U.S. gateways to Lima, and from there it is an hour flight to Cuzco, the ancient Inca capital. LAN Airlines has the most direct routing as it serves several major U.S. cities, including Los Angeles, New York, San Francisco and Miami, with a seamless link to Cuzco. Once in Cuzco the choices are generally foot or train down to Machu Picchu. The Inca Trail is a five-day trek over some high passes. It is a spectacular way to enter the citadel of Machu Picchu, but it requires a measure of fitness. It is easy to take several types of trains the 70 miles from Cuzco to Aguas Calientes, the town at the base of the Lost City. The most deluxe train experience is the one-car Incan Princess. Once at Aguas Calientes it is a bus ride up a steep, severe chevron of a road to the Sacred City of the Inca. The government now limits the number of visitors to 5,000 a day, so it’s best to get your ticket in advance, as some folks have been turned away at the entrance gate after making the long trip. You can make your own arrangements or book through a number of veteran outfitters such as Mountain Travel Sobek. They will arrange all tickets, transfers, transport, accommodations and guides. When is the best time to see Machu Picchu? Machu Picchu is open year-round, but October to April is the rainy season, and therefore it has the fewest visitors. The inconvenience of rain is offset by the lack to tourists, and it is worth considering. Avoid holidays if you can, as Machu Picchu and everything surrounding it is packed. Once at Aguas Calientes (hotel tip: check in at The Incaterra), to avoid the crowds and witness one of the most spectacular sunrises in the world, take the first bus from Aguas Calientes, which leaves at 5:30 a.m. It’s worth it. There are no bathrooms, restaurants or drinking water once you enter the site, but there are facilities just before the entrance. So hold onto your entrance ticket so you can exit and re-enter. Pack sunscreen, a sun hat and water. Weather in the Andes can also change in an instant, so you should also pack a rain jacket. Sturdy shoes are a must. If you are in reasonable shape, sign up to climb Huayna Picchu, the famous peak within the ruins that appears in most photos. They only allow 400 a day to climb, so sign up the day before and go early for best views. What else can you do in the area? If you have time, sign up for the day raft trip on the Urubamba through the Sacred Valley of the Incas — one of the most spectacular float trips in the world. And, of course, plan on spending at least two days in Cuzco, a unique blend of European and Inca sensibilities with superb restaurants, hotels and accessible ruins. And try to make a stop at the nearby Pisac market, one of the most colorful bazaars in the world. Most people visit Pisac on Sunday, the main market day, but there are smaller markets on Tuesday and Thursday. Finally, consider extending your trip to other wonders of South America, including the Galapagos, Easter Island and Iguazu, all of which are served by LAN Airlines, with Lima as the hub. What makes Machu Picchu so special? There is a harmony of elements here, the man-made and the natural. It is a stunning integration of architecture, setting, function, space and form. The Inca knew something we seek: When order combines with complexity, when elegance appears effortless and when there is a coherent but unspoken relationship among the parts, then there is enduring beauty.